January 10, 1990 - The FAA issued a type certificate for the McDonnell Douglas MD-11, a 3-engine medium-to-long-range wide-body jet airliner. Based on the DC-10, it features a stretched fuselage, increased wingspan with winglets, refined airfoils on the wing and smaller tail plane and increased use of composite materials. Two engines are mounted on the under wing pylons and a third engine at the base of the vertical stabilizer. 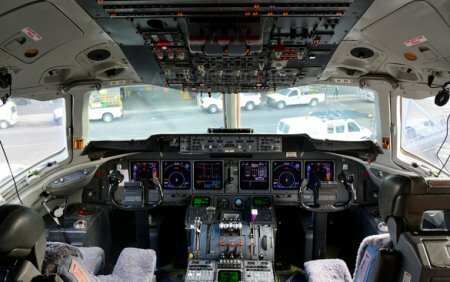 It also features a glass cockpit that decreases the flight deck from the 3 required on the DC-10 to two by eliminating the need for a flight engineer. Maximum speed is 587 mph, range is 7,873 miles and passengers = 410. January 18, 1990 - An Eastern Air Lines Boeing B-727 from Montreal, Canada to Atlanta collided on landing with a twin-engine Beechcraft King Air 100 that had just touched down, killing one person and injuring another aboard the King Air. The B-727 tore off much of the roof of the King Air. The King Air was still taxiing on the runway when the Eastern B-727 landed behind him, and they collided on the runway. Both aircraft were in contact with the Atlanta control tower at the time of the crash. The accident killed the pilot of the King Air, which was operated as a charter by Epps Air Service. 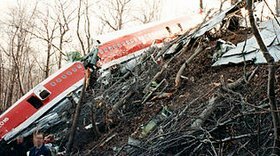 January 25, 1990 - Avianca Flight 52 a Boeing B-707 from Bogotá, Colombia to New York ran out of fuel on approach to JFK International airport causing the jet to descend without power, clipped several trees and posts and crashed onto a hillside in the village of Cove Neck, New York, on the north shore of Long Island. The fuselage partially fragmented into three distinct pieces. The cockpit and forward cabin separated from the rest of the airframe and were hurled over the crest of the hill 90 feet from the rest of the wreckage. Contributing to the crash were the failures of the flight crew, the weather, air traffic controller performance and FAA traffic management. 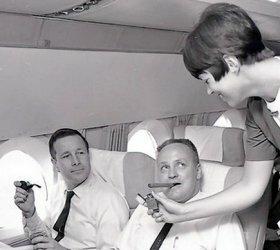 February 25, 1990 - FAA announced that smoking is prohibited on all scheduled U.S. domestic airline flights. Flights to or from Alaska or Hawaii scheduled to last 6 hours or more were excepted. This prohibition included foreign carriers operating between two points within U.S. territory. 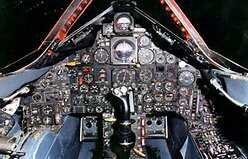 The ban did not apply to the flight deck. March 6, 1990 - An SR-71 Blackbird reconnaissance aircraft landed at Dulles International Airport after a record-breaking 68-minute flight from the Pacific coast, and was then retired to the National Air and Space Museum collection. April 9, 1990 - Atlantic Southeast Airlines Flight 2254, an Embraer EMB-120, from Muscle Shoals, Alabama to Atlanta, Georgia was involved in a Mid-Air collision with a Cessna-172 over Gadsden, Alabama resulting in the death of the pilot and passenger of the Cessna-172. The ASA flight turned left after takeoff, toward the east towards Atlanta at an assigned altitude of 5,000 feet. The Cessna-172 was westbound at the same altitude, facing the setting sun. During the head-on collision, the right horizontal stabilizer of the EMB-120 was torn from the aircraft. The ASA flight managed to return to Northeast Alabama Regional Airport with no injuries. The Cessna-172 crashed into a field and two people died. The NTSB attributed the probable cause of the crash to be "inadequate visual lookout by the pilots of both aircraft which resulted in their failure to see-and-avoid oncoming traffic". The sun's glare, restricting the vision of the Cessna-172 was also a factor in this accident. April 18, 1990 - A Federal bankruptcy judge removed Eastern Air Lines from the control of Texas Air Chairman Frank Lorenzo. Eastern had lost more than $1 billion since it filed for Chapter 11 protection last year. Scandinavian Airline System bought Lorenzo's interests in Continental Airline Holdings (formerly known as Texas Air Corporation). May 10, 1990 - FAA announced that a contract for development of a prototype program for Air Traffic Control training had been awarded to Hampton University, a private historically black university located in Hampton, Virginia. Hampton joined the Air Traffic Control Training Center at Eden Prairie, Minnesota (Minneapolis suburb) as one of two institutions receiving Federal funds as part of the Collegiate Training Initiative (CTI). Graduates of CTI programs became eligible to apply to FAA for employment as developmental controllers without having to attend the FAA Academy in Oklahoma City, OK.
August 15, 1990 - FAA and the Community College of Beaver County, Pennsylvania, signed an agreement under which the college would conduct a 5-year prototype training program for air traffic controllers. Qualified graduates would be eligible to become controllers without attending the FAA Academy. 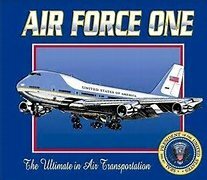 September 6, 1990 - A new Air Force One made its maiden voyage. This specially designed Boeing B-747, and its identical backup jet, replaced 2 twenty-year-old Boeing B-707s. The DC-9 was cleared from the gate towards Runway 3, but missed turning onto a taxiway and to correct the error they were instructed to turn right on another taxiway, but instead they turned onto the active Runway 3. Five seconds later the B-727 had just been cleared for takeoff and was heading towards the DC-9. The B-727 wing hit the right side of the DC-9 and cut through the fuselage just below the windows until it cut off the DC-9's number 2 engine. The DC-9 caught fire and was destroyed; the B-727 just had a damaged wing and was later repaired. The captain of the DC-9 escaped from the aircraft through the left sliding window. 18 people escaped from the left over-wing exit, and 13 got out through the left main boarding door and 4 people jumped from the right service door. The rear jump seat flight attendant and a passenger died from smoke inhalation in the tail cone. 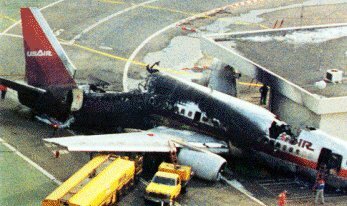 The NTSB determined that the probable cause of this accident was a lack of proper crew coordination, including a virtual reversal of roles by the DC-9 pilots, which led to their failure to stop taxiing and alert the ground controller of their positional uncertainty in a timely manner before and after intruding onto the active runway. Contributing cause were deficiencies in the air traffic control services, including failure of the ground controller to take timely action to alert the local controller to the possible runway incursion, inadequate visibility observations, failure to use progressive taxi instructions in low-visibility conditions, and issuance of inappropriate and confusing taxi instructions compounded by inadequate backup supervision for the level of experience of the staff on duty. Also contributing to this accident were deficiencies in the surface markings, signage, and lighting at the airport and the failure of the FAA surveillance to detect or correct any of these deficiencies. Northwest Airlines also failed to provide adequate Cockpit Resource Management training to their line air crews. February 1, 1991 - USAir Flight 1493, a Boeing B-737, in a night approach landing at Los Angeles International Airport (LAX) landed atop a Sky West Airlines Flight 5569, a Fairchild Metroliner III commuter plane waiting to take off from the same runway. The USAir B-737 crushed the twin-engine turboprop and continued down the runway the Metroliner beneath it, exited the runway, and caught fire. When the USAir jet touched down, and the nose was being lowered, the first officer noticed the Metroliner on the runway and applied maximum braking, but it was too late. The USAir B-737 slammed into the Metroliner, crushing it beneath its fuselage and proceeded to skid down the runway, then veered off the left side and came to rest on the far side of the taxiway against a building as fire began. The local air traffic controller was distracted when an aircraft inadvertently switched off the tower frequency and a misplaced flight progress strip resulted in the Sky West flight being told to taxi into takeoff position while the USAir flight was landing on the same runway without the Metroliner ever being given a takeoff clearance. The NTSB listed this accident's probable cause as LAX air traffic control management deficiencies that lead to a controller's issuing inappropriate clearances. The NTSB also recommended the use of different runways for takeoffs and landings at LAX. FAA actions after this accident included assigning additional controllers to the tower and adjusting runway lights to prevent glare from obstructing the view from the tower. A week later the FAA announced a Runway Incursion Plan that included tests of advances in runway marking, lighting, and signs. They also amended its ATC Handbook to prohibit controllers from authorizing aircraft to hold at a taxiway/runway intersection at night or when the intersection was not visible from the tower. February 18, 1991 - FAA announced plans to build a new Terminal Radar Control Facility (TRACON) at Elgin, Illinois, to handle air traffic in the Chicago Metropolitan area. The NTSB determined that this accident was possibly caused by a defect in the design of the B-737's rudder power control unit (PCU). They also looked at the possible effect of powerful rotor winds from the nearby Rocky Mountains might have had, but there was not enough evidence to prove this hypothesis. They could not identify conclusive evidence to explain the loss of United Airlines Flight 585. When another B-737 crashed a few years later, the NTSB reopened its investigation, due to the similar nature of the circumstances. It was now determined that the crash of United Airlines Flight 585 was the result of a sudden malfunction of the aircraft's rudder power control unit, and they issued a revised final report which found that Flight 585's pilots lost control of the jet because of a mechanical malfunction. The rudder surface most likely deflected in a direction opposite to that commanded by the pilots as a result of a jam of the main rudder power control unit servo valve secondary slide to the servo valve housing offset from its neutral position and over-travel of the primary side. April 1, 1991 - A Northwest Airlines B-747 began a series of test flights in Soviet airspace as part of a cooperative program to develop a satellite navigation system in which aircraft would receive signals from both the U.S. Global Positioning System (GPS) and the Soviet Global Orbiting Navigation Satellite system (GLONSASS). GPS is a satellite-based radio-navigation system controlled by the U.S. Department of Defense. When completed, it will include 24 satellites orbiting 11,000 miles above the earth. 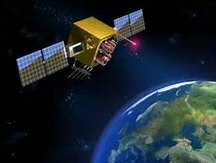 The Global Positioning System (GPS) is a space-based navigation system that provides location and time information in all weather conditions, anywhere on or near the Earth where there is an unobstructed line of sight to four or more GPS satellites. 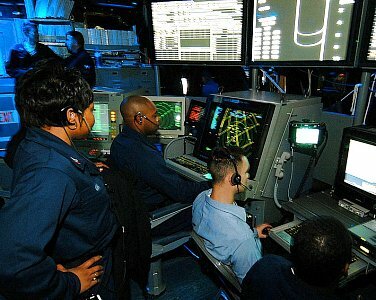 The system provides critical capabilities to military, civil, and commercial users around the world. April 5, 1991 - Atlantic Southeast Airlines Flight 2311 using a twin-turboprop Embraer EMB-120 Brasilia, from Atlanta to Brunswick, Georgia, crashed just north of Brunswick while on approach for landing. All 23 people aboard the plane were killed. The EMB-120 deviated slightly in its flight path to Brunswick to avoid poor weather. The flight crew acknowledged to Jacksonville Air Route Traffic Control Center that the airport was in sight and they were cleared for a visual approach. Witnesses reported seeing the aircraft at a lower than normal altitude, and the airplane suddenly rolled to the left until the wings were perpendicular to the ground.  The aircraft then descended in a nose-down attitude and disappeared behind trees two miles short of the runway. (23 Fatalitiies) Former Texas Senator John Tower and his daughter were among those killed. The NTSB determined that the probable cause of this crash was the loss of control in flight as a result of malfunction of the left engine propeller control unit which allowed the propeller blade angles to go below the flight idle position. Contributing to the accident was the deficient design of the propeller control unit. The NTSB found that the flight crew would have been unable to perceive any problem with the airplane until the propeller blade angle was between 24 and 26 degrees, and did not notice a problem with the airplane until the propeller begin to over speed and roll control was affected. The flight crew would have been unable to declare an emergency as the event was so sudden. The NTSB also found that the Atlantic Southeast was overworking pilots, estimating that the pilots only received 5 to 6 hours of sleep and raised concerns that the airline scheduled reduced rest periods for about 60% of the layovers in its day-to-day operations. September 11, 1991 - Continental Express Flight 2574, an Embraer EMB-120T from Laredo to Houston, Texas, crashed near Eagle Lake, Texas (about 65 miles Southwest of Houston), killing all 14 people on board. The NTSB determined that the probable cause of this accident was the failure of Continental Express maintenance and inspection personnel to adhere to proper maintenance and quality assurance procedures for the airplane's horizontal stabilizer de-ice boots that led to the sudden in-flight loss of the partially secured left horizontal stabilizer leading edge and the immediate severe nose-down, pitch-over and breakup of the airplane. Additionally the NTSB determined that the failure of the Continental Express management to ensure compliance with the approved maintenance procedures contributed to this crash. Also the failure of FAA surveillance to detect and verify compliance with approved procedures. October 1, 1991 - FAA received 6 British Aerospace BAE-800 aircraft from the Air Force. The FAA took over the last of the Air Force's capability to conduct flight inspections of air navigation aids. FAA's flight inspection fleet inventory now includes 6 BAE-800s, 19 Beechcraft BE-300s, 1Beechcraft BE-F90, 3 North American 265-80 Sabreliners, plus 5 other aircraft with disposal action pending. They also plan to acquire a Learjet 60 and a Canadair 601 aircraft. The total fleet consists of 47 owned and 2 leased aircraft including 15 aircraft for training, research and development and support functions. November 13, 1991 - Midway Airlines ceased operations at midnight. Earlier that day Northwest Airlines had dropped plans to acquire Midway which had filed for Chapter 11 Bankruptcy protection in March. Note: on November 15, 1993, a smaller new carrier named Midway Airlines began service from Chicago Midway airport. December 4, 1991 - Pan American World Airways ceased flying after 64 years of operations. At an auction of Pan Am assets five days later, United Airlines emerged as the largest purchaser of the Latin American routes. Remaining Pan Am property, industrial and office equipment will be auctioned off at a later date. Pan American World Airways, known from its founding until 1950 as Pan American Airways and commonly known as Pan Am, was the principal and largest international air carrier in the United States from 1927 until this date. Founded in 1927 as a scheduled air mail and passenger service operating between Key West, Florida and Havana, Cuba, the airline became a major company credited with many innovations that shaped the international airline industry, including the widespread use of jet aircraft, jumbo jets, and computerized reservation systems. Pan Am was also the founding member of the International Air Transport Association (IATA), the global airline industry association. the use of the word "Clipper" in aircraft names and call signs, and the white pilot uniform caps, the airline was a cultural icon of the 20th century. 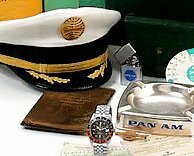 Pan Am was the unofficial overseas flag carrier of the United States as they competed in an era dominated by flag carriers that were wholly or majority government-owned. 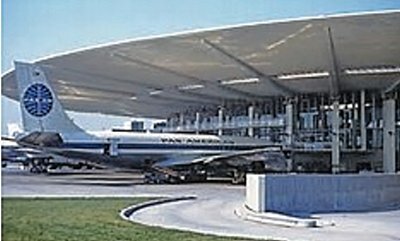 Pan Am's flagship terminal was the Worldport located at John F. Kennedy International Airport in New York City.